Here is the final sectional panel from the ‘In Retrospect: 40 Years of the National Gallery of Jamaica‘ exhibition. 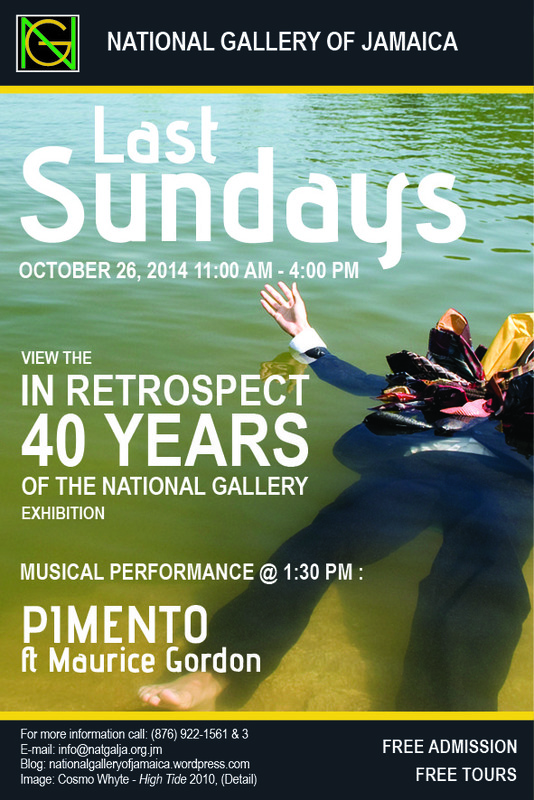 The exhibition continues until November 15, 2014. A.D. Scott Collection: in 1990, the National Gallery received 38 major works from the most important private collection of the 1960s and 70s, namely the collection of A.D. Scott, a well-known civil engineer and art patron and the founder and operator of the Olympia International Art Centre, which opened in 1974. The collection reflects Scott’s close association with the key figures in post-Independence art in Jamaica, namely the principals of the Contemporary Jamaican Artists Association Barrington Watson, Eugene Hyde and Karl Parboosingh, but also other major figures such as Carl Abrahams, Edna Manley, Albert Huie, Osmond Watson and Christopher Gonzalez, who are all represented in this section with major examples of their work. Aaron and Marjorie Matalon Collection: Aaron Matalon, a leading entrepreneur of the post-Independence period, was a major patron of the arts and the National Gallery’s Chairman from 1993 to 2002. In 1999, Mr Matalon and his spouse donated a collection of 218 works of art, the largest and arguable most important donation to be received by the Gallery. The Matalon Collection includes prints and other works of art from the colonial period, starting with the earliest published map of Jamaica, and modern Jamaican art. A significant portion of the Aaron and Marjorie Matalon collection is on permanent view in the historical galleries but this section features a selection of the modern works. 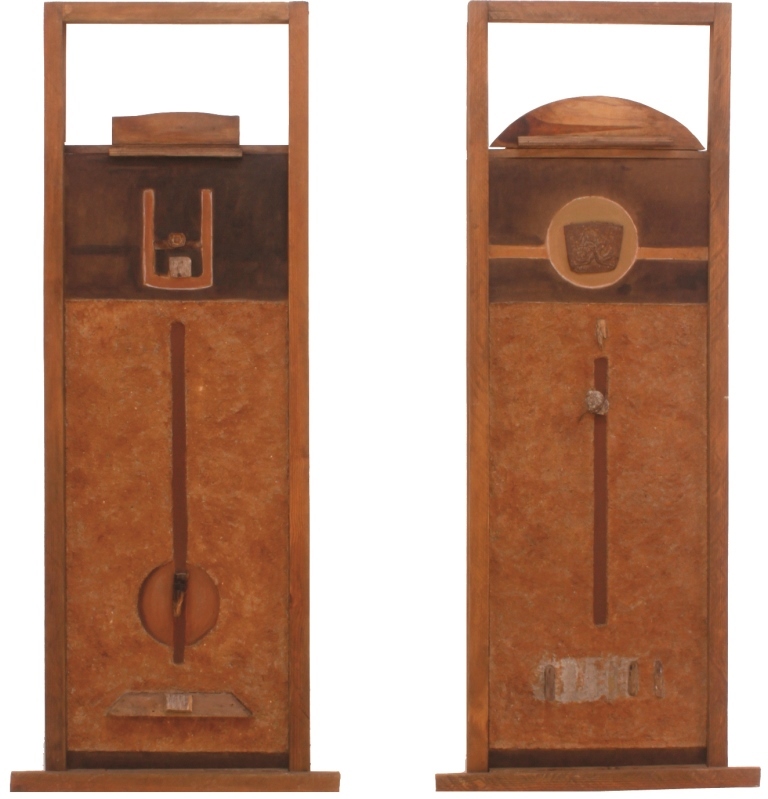 Guy McIntosh Donation: The most recent major donation received by the National Gallery came from art dealer and collector Guy McIntosh and consisted of 80 works of art, mainly by artists who had come to prominence in the 1980s and 90s, such as Milton George and Omari Ra. Several other major donations remain in their usual place in the permanent galleries and we invite you to view them there. One is the Edna Manley Memorial Collection, which the result of a major campaign for donations after Edna Manley’s passing in 1989, with major donations coming from of Michael Manley, Burnett Webster, A.D. Scott, Aaron and Marjorie Matalon, David Boxer, Wallace Campbell, the Pan-Jamaican Investment Fund and the ICD Group – these works can be seen in the Edna Manley Galleries. Another major donation was the John Pringle Collection, a group of 23 paintings by Mallica ‘Kapo’ Reynolds from the estate of the John Pringle, Jamaica’s first Director of Tourism and the founder of Round Hill Hotel and Villas. This collection was received in 2011 and a selection can be seen in the Kapo Galleries. 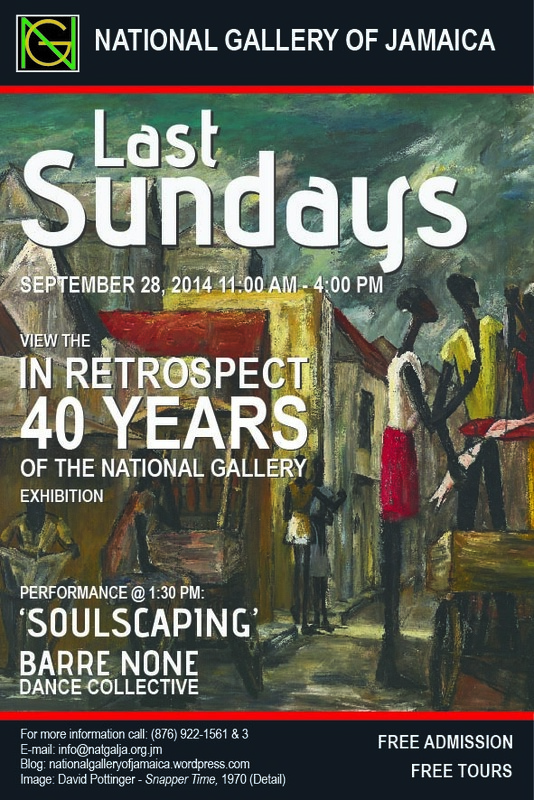 The National Gallery’s Last Sundays programme for September 2014 is scheduled for Sunday, September 28, from 11 am to 4 pm, and will feature the In Retrospect: 40 Years of the National Gallery of Jamaica exhibition and a dance performance, titled Soulscaping, by the Barre None Dance Collective. The In Retrospect: 40 Years of the National Gallery of Jamaica exhibition opened on August 31 and represents the first major event in the National Gallery’s 40th anniversary celebrations. In Retrospect tells the National Gallery’s story through its exhibitions and publications, through major donations, and through the debates that have surrounded the Gallery from its earliest years, with a special focus on the Gallery’s role in articulating how Jamaican art is understood. The exhibition consists mainly of key works from the Gallery’s collection and features a diverse range of artists from the 18th to the 21st century, including John Dunkley, Edna Manley, Ebony G. Patterson, Isaac Mendez Belisario, Mallica ‘Kapo’ Reynolds, Albert Huie, Barrington Watson, Eugene Hyde, Vermon ‘Howie’ Grant, Karl Parboosingh, Leasho Johnson, Carl Abrahams, Robin Farqueharson, George Robertson, David Boxer, Laura Facey, Maria LaYacona, Petrona Morrison, Omari Ra, Cecil Baugh, Matthew McCarthy, Everald Brown, Norma Rodney Harrack, A. Duperly and Sons, Osmond Watson, Renee Cox, Marlon James, and Colin Garland. The dance performance Soulscaping by the acclaimed and innovative Barre None Dance Collective, which will start at 1:30 pm, was choreographed by Oniel Pryce and the dancers will be Neila Ebanks, Sophia Mckain and Kayon Wray. Barre None has described the performance concept as follows: ‘The soul is the self, the “I” that inhabits the body and acts through it. Without the soul, the body is like a light bulb without electricity, a computer without the software, a space suit with no astronaut inside. With the introduction of the soul, the body acquires life, sight and hearing, thought and speech, intelligence and emotions, will and desire, personality and identity.’ The performance was choreographed for the National Gallery space and will interact with parts of the In Retrospect exhibition. As is now customary for Last Sundays, admission to the NGJ will be free on Sunday, September 28, and guided tours and children’s activities will also be offered free of cost. Our gift and coffee shop will be open for business and contributions to the donations box are welcomed. Revenues from our shops and donations help to fund programmes such as the In Retrospect exhibition and our Last Sundays programming. Here is the fourth major text panel from the present In Retrospect: 40 Years of the National Gallery of Jamaica exhibition, along with the more detailed text panels from the Ceramics and Photography sections. This section explores some of the alternatives to and departures from the art-historical narrative and artistic hierarchies the National Gallery articulated in its early years. Some were readily accommodated by the Gallery, or actually came from within, while others came about as a result of external challenges but these course corrections have all added to the dynamic and diverse picture presented by the National Gallery’s collections and exhibitions today. The hierarchies of Jamaican art had already been challenged before the National Gallery was established. The Contemporary Jamaican Artists Association (1964-74), which was established by Barrington Watson, Karl Parboosingh and Eugene Hyde, presented a challenge to the tenets and dominance of the nationalist school and advocated the professionalization of art and the development of individual and corporate art patronage. Most importantly, they wanted to be recognized as artists first, and as Jamaican artists second. While the National Gallery included these artists and others who similarly departed from the conventions of the nationalist school in its exhibitions and acquisitions from early on—a Parboosingh retrospective was for instance staged in 1975, the year he died—the ideas about art the Gallery articulated existed in lingering tension with those advocated by these artists, as was illustrated by the Intuitives controversy which was discussed in the previous section. Here is the third sectional text panel in the In Retrospect: 40 Years of the National Gallery of Jamaica exhibition, which continues until November 15. The Jamaican Art 1922-1982 exhibition, which was a collaboration between the National Gallery and the Smithsonian Institution Traveling Exhibition Service, was the first and most ambitious survey of Jamaican art to tour internationally. The exhibition, which was curated by David Boxer and Vera Hyatt, consisted of 76 paintings and sculptures, many of which came from the NGJ Collection, although there were also loans from private and corporate collections. Between 1983 and 1985, it was shown at 11 venues in the USA, including the Inter-American Development Bank Gallery in Washington D.C., where it premiered, and the Wadsworth Atheneum in Hartford, Connecticut. It was also shown at the Hart House Gallery at the University of Toronto in Canada and the National Museum of Port-au-Prince in Haiti. The exhibition had its final showing at the National Gallery in 1986, on its return to the island.